In May 2008, I observed 30 years as a professional woodcarver. My first conscientious efforts centered on my Boy Scout related interest in Native American culture. Among the usual camp craft items, I carved and decorated several Hopi kachinas. In spite of subsequent academic degrees, I never got far from my boyhood joy of working with my hands. After a few years of public school teaching and construction work, I began a wooden sign business, but transitioned to architectural and furniture work. Well, I can talk about influences. I had parents who encouraged me both academically and in the arts. Both had artistic hobbies and were collectors. Being brought up and living as I still do in the Blue Ridge Mountains (eastern range of the Appalachians) with a diverse deciduous forest, there is no question that the natural world has had the most influence on my design preferences. I attribute my fascination with nature to the reading of Walden, or Life in the Woods, by Henry David Thoreau and to my older brother, a chaired professor of biology. My favourite courses in high school were mechanical drafting and architectural drawing which fostered a life-long interest in architecture. The leaf. The leaf epitomises many archetypal aspects of life; the cycles of life, as well as symbolic qualities of victory, peace, mourning, exuberance, and so forth. 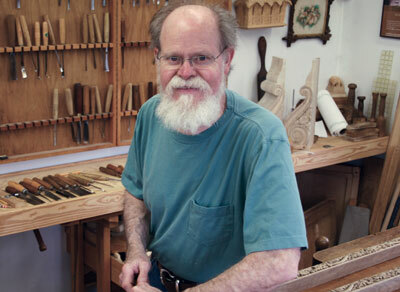 Benn Pitman, an American woodcarver of the Aesthetic Movement asks: "And are not leaves the prime element of beauty on this earth?" I might add, to tweak a phrase from Thoreau, appropriate to the current planet in crisis: "In leaves is the preservation of the world." Several summers during college, I participated in the archaeological excavations in Winchester, Hampshire and was in the habit of sitting in the cathedral before breakfast. It was among the bones of Saxon kings that I acquired a deep respect for the intricacies and ironies of history - its many layers as it were. Now, as I study books on ornamental history, I am humbled by my place among the artisans who have created our cultural heritage. When I study an older woodcarving, I make a connection with the carver, whether appreciating his mastery or sympathising with his misery, noting his felicity of technique or the foibles of his design. I am finishing some Gothic style grapevine moulding for an organ case for the Cathedral of St John the Divine, New York City. In the next few weeks I will work on an eclectic mix of Japanese heraldic symbols, two classical console brackets, and several tracery panels for a small organ, as well as a pair of griffins for a mantel frieze. If you weren't a carver, what do you think you would you be? I am also a writer as you may know and am currently working on several manuscript ideas. 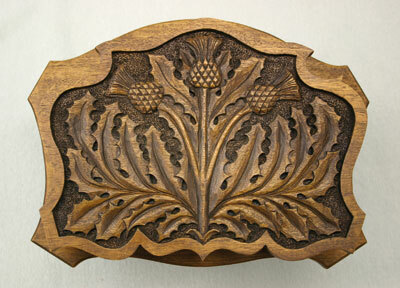 My third book, Decorative Woodcarving: Accessories for the Home, has just been published by GMC Publications. I have published a variety of work including poetry and journalistic pieces over the years. Through my interest and knowledge of the decorative arts and the history of ornament, I could pursue a number of crafts: stained glass, printmaking and blacksmithing. I kept bees for a few years and would like to keep several hives again. Three grandchildren keep me busy on a wide assortment of projects, especially the two-story tree house! Describe the view from your workbench. Beyond carving samples and models on windowsills, I gaze into the sassy greens, the maple maroon, and the white haze of cherry blooms of early spring. I live in a rural town of several hundred, but beyond the village bustle is Peebles Mountain, still grey along the ridge. Describe the area where you live. Virginia, the first permanent English settlement in America, is an historic state where some of the Revolutionary War and much of the American Civil War were fought. Thomas Jefferson built his classical home here, Monticello - a World Heritage site, I believe - and the University of Virginia is nearby. 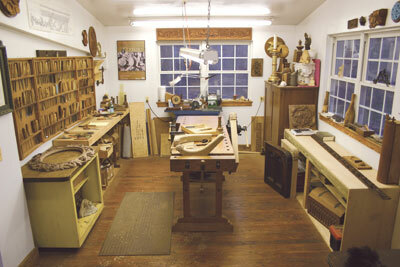 Do you like to listen to music when you carve? At times the whispers of the gouge are interrupted by the chick-a-dee or house wren chattering on the wood pile outside my window. Other times, confidence desires company, so classical music seems to complement the work. I feel fortunate to have worked with some well-known architects, millwork companies, and designers. I have been a part of some important restorations and some incredible new buildings. There is tremendous gratification to make a video as part of the Cincinnati Art Museum's permanent exhibit on art-carved furniture, or to be honoured with an Award of Excellence by the Architectural Woodwork Institute. Among the several hundred gouges I have, it is hard to play favourites; some specialised tools which don't see much use, have a hard time competing with those which do. 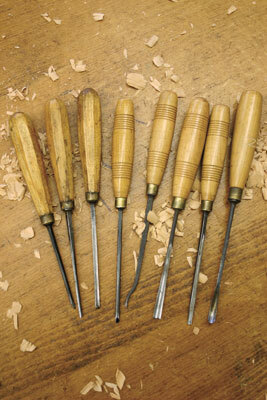 Yes, I have tools I prefer and interestingly these are the ones for which I make custom handles. I have representatives from most contemporary European manufacturers, but I also purchase older tools. Are you a vehement self-critic? My wife says I am! I am a perpetual apprentice to my life and work. I strive for balance between idealism and practicality. "I strive for balance between idealism and practicality"